Many of you already know that we periodically design and offer our own patterns for free but, for those who may be new to our blog, I thought I would take today’s post to highlight several that make for great spring and summer knitting projects. Click here to purchase yarn. Summer Fling is the perfect little summer bag for strolling around town, light shopping, or meeting friends for a cocktail on a terrace! The bottom is knit flat and then stitches are picked up for knitting the main body in the round. Handles are then knit flat one at a time and are joined using Kitchener stitch. 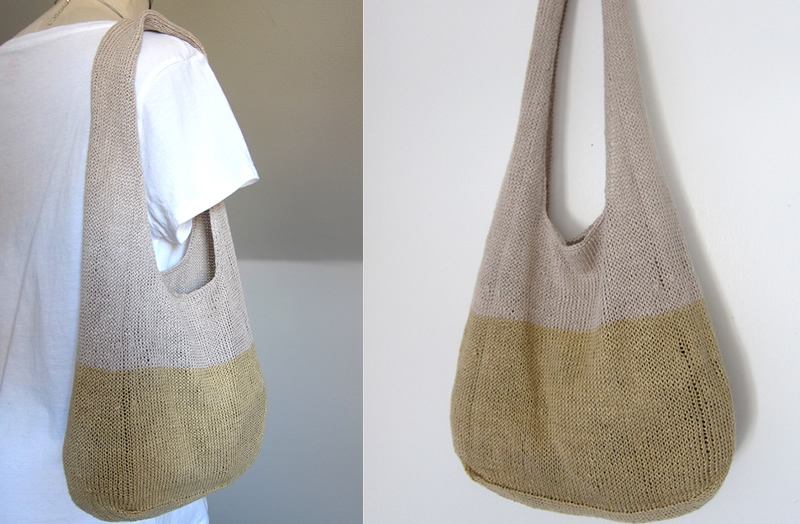 Knit with Sparrow yarn from Quince & Co. this bag is both pretty and casual and the 100% linen content makes it strong and durable. Form and function! Both elegant and minimalist, our Aisé wrap is a lovely warm weather accessory. It can be worn formally or casually depending on the occasion (think little black dress or jeans) and the laceweight blend of linen (42%) and cashmere (58%) make it ideal for use in air conditioned offices and on spring days and cool summer evenings. 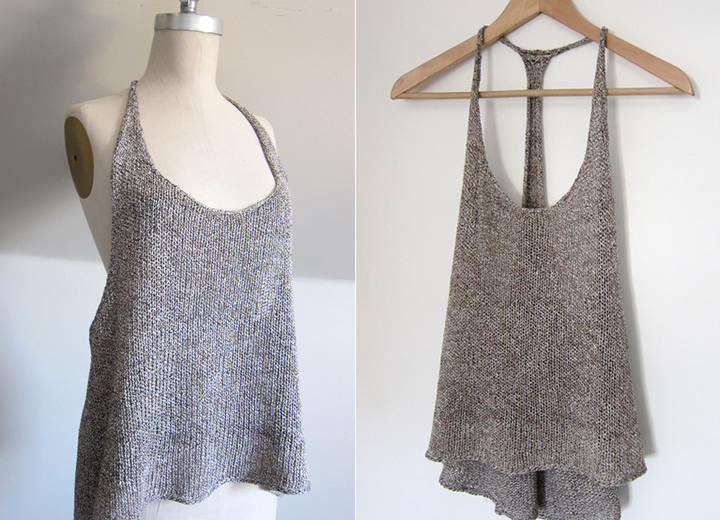 Knit with Sylph yarn from Jade Sapphire the fabric of this piece is soft and airy with a slight texture. Knit with Classic Elite Yarns Firefly (25% Linen / 75% Viscose), our Firefly Tunic combines a softly draping neckline, drop shoulders, and a longer a-line body in a relaxed summer pullover. The blend of linen and viscose produces a crisp fabric with beautiful drape and a slight sheen. 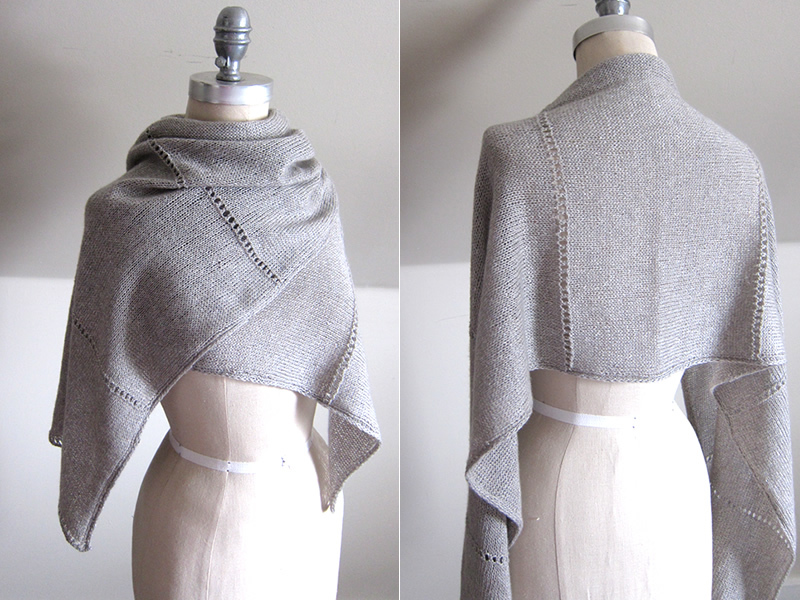 A separate cowl adds flare and versatility! Like Léger (see below), this pattern includes directions for 11 sizes and can be easily adjusted in terms of body and sleeve length. Knit in the round from the bottom-up. Sleeves are knit flat and seamed. 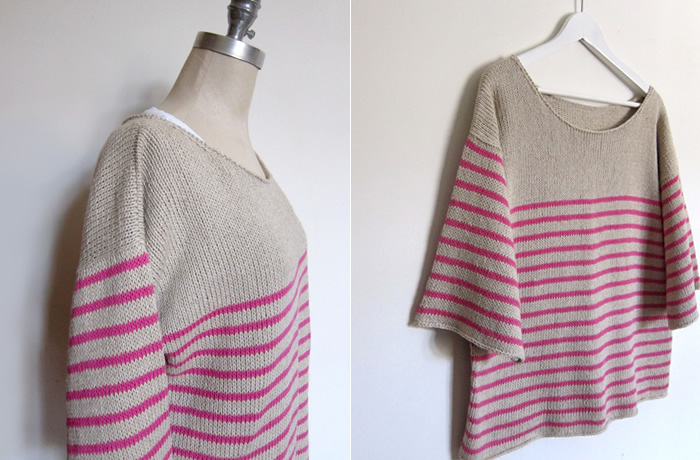 Knit with Rowan Creative Linen (50% cotton / 50% linen), Léger combines a boat neck, drop shoulders, and nautical stripes in an easy-to-wear casual summer pullover. The pattern includes directions for 11 sizes and can be easily adjusted in terms of body and sleeve length. Knit in the round from the bottom-up. 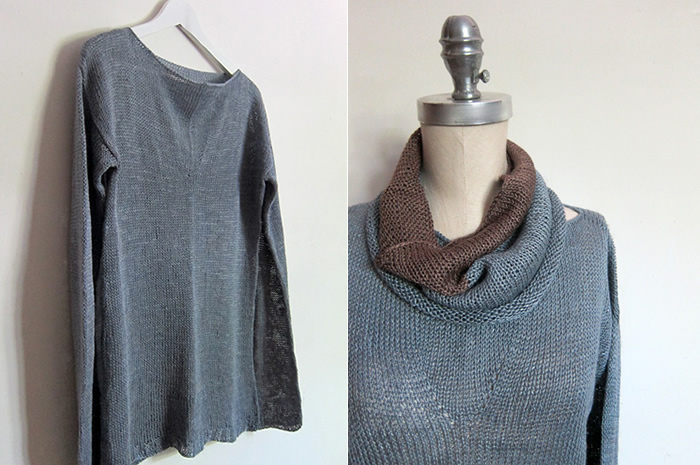 We love how this simple tee turned out with two colours of Habu Wrapped Merino. The back and front of the Double-Take Tee are identical so you can decide which colour to wear facing forward based on your mood or outfit! Simple, lightweight, and chic – perfect for spring and summer. 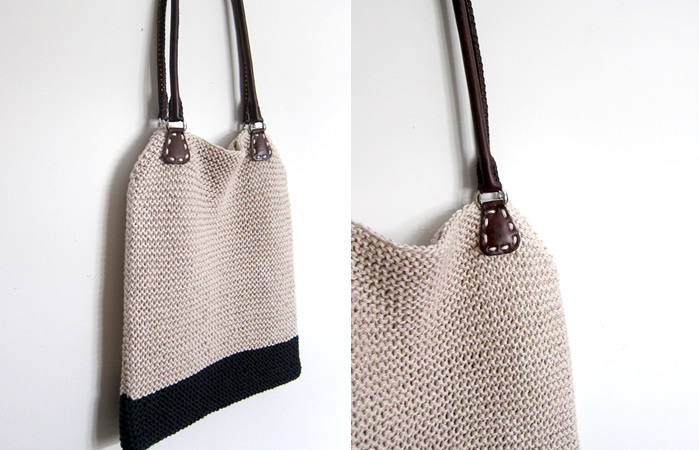 A great summer tote knit with Hemp for Knitting’s allHemp6LUX (100% Hemp) and finished with a pair of rolled leather handles from Greyson E. As the name implies, the Simple Hemp Tote is a super easy project that knits up in no time. It’s worked as a long rectangle with angled corners, folded in half and seamed to finish. Classic in style, the combination of brown, natural, and black makes this a great casual bag that will work with most outfits (and shoes!). Still, we can see this knit in a variety of colour combinations making the most of the beautiful shades available in allHemp6LUX and the various colours of Grayson E. handles (e.g. Brown, Amber, Buckskin, Olive, Red, Black). 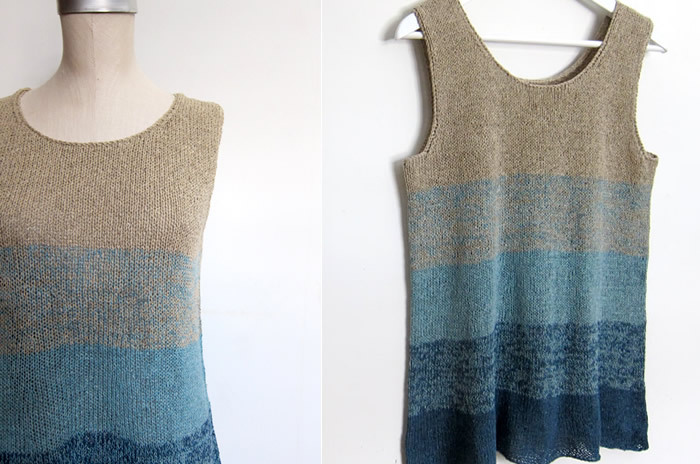 Knit with Habu Textiles Tsumugi Silk (100% silk) our Ombre Tank is ideal for hot summer days. If you can’t wait, layer it with a tee and you’re set for spring. We used the same technique as the Ombre cowl to achieve the gradation of colours. The fabric is crisp yet soft and supple at the same time and the A-line shaping is very flattering on most body types. Lower body is knit in the round and front and back neckline are kept the same – an easy knit with minimal finishing work. 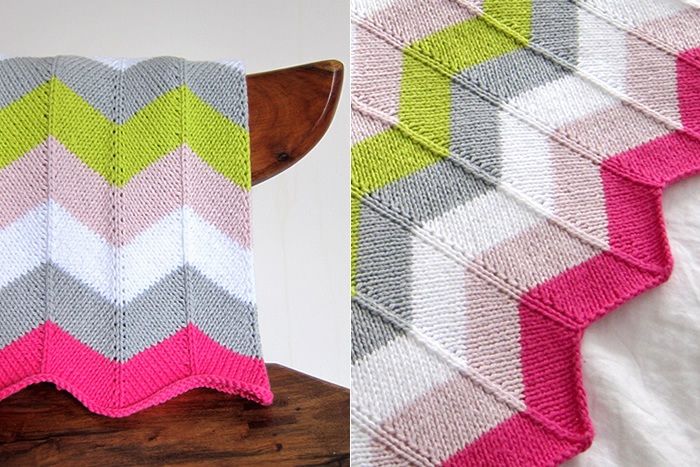 We modified our popular Chevron Colour-Block Blanket to create this cheerful and modern baby blanket using Blue Sky Alpacas Worsted Cotton. One skein each of 5 colours. Easy-peasy and fun to knit! This lengthwise scarf/wrap which is knit in-the-round and then “steeked”, uses two luxury yarns we couldn’t resist pairing. One skein each of Tanis Fiber Arts Red Label Cash Silk Single and Handmaiden Fine Yarn Maiden Hair along with this simple pattern are all you need to create this soft and luminescent wrap.